when my hdd is full, i moe something. bad thing is, when i move many files, pathfinder deletes them only after the complete task is done, not file by file. but i think it is useful. maybe you have a new idea now. is there an option or could the coders think about changing it ? also just bought a copy of your nice programm. Path Finder Support Team closed this discussion on 27 Jan, 2019 01:41 PM. 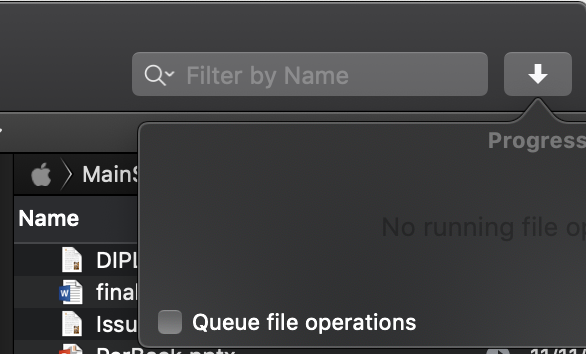 1st: of course i am talking about to queue my file operations. All files are deleted from A only after the last file has arrived at B. This is what a similar programm (on PC) is doing it. 2nd question: i am new here, why is the discussion only private? or why is it closed, did you do it? Thank you for all answers and support and your App/programm! Sure, I can submit this behavior to our developers as a feature request. The discussion is public now. It's private by default and you can change that. Also, the discussion gets closed after each our reply by our system but you and others should always be able to re-open it. Path Finder Support Team closed this discussion on 28 Jan, 2019 08:36 AM. > Thanks for the additional details. > Sure, I can submit this behavior to our developers as a feature request. > you and others should always be able to re-open it. > Please feel free to write us back and we will be happy to assist you. Path Finder Support Team closed this discussion on 28 Jan, 2019 09:55 AM.